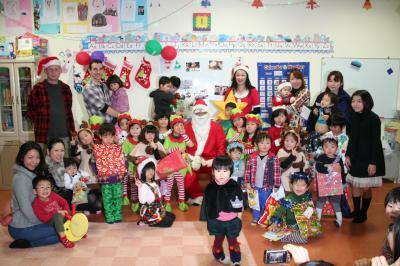 On December 23rd we had our Christmas party. 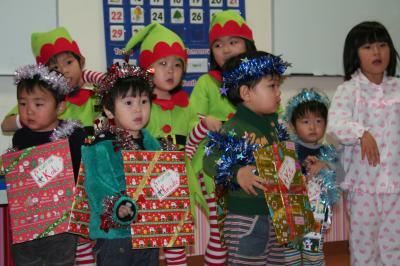 First part we played games and sang a few songs, played the handbells, and performed our Christmas play. Afterwards we had a potluck party! 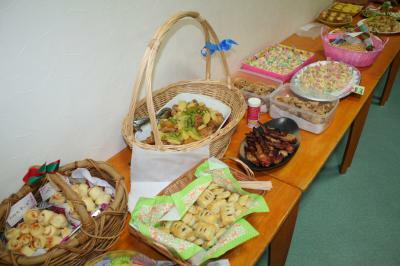 Our parents brought nice food and we enjoyed a meal together. We had really great time. Thank you everyone for cheering us on and helping us. 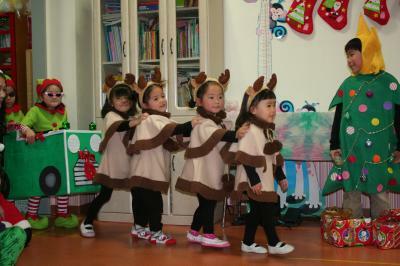 Our mommies made costumes for us to wear in our christmas play. They are so wonderful, we can’t wait to wear them at our christmas party . Today we had a dress reheasal. We are looking forward to performing the play for real this Monday. We are practicing playing music with hand bells. 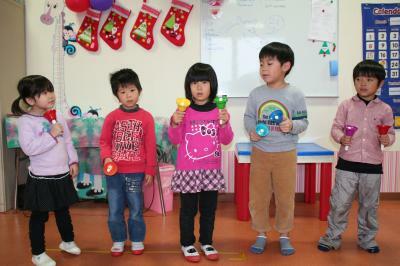 We will play, ” Joy to the World” with hand bells at our Christmas party. We put an Advent calendar in our classroom at the beginning of December. 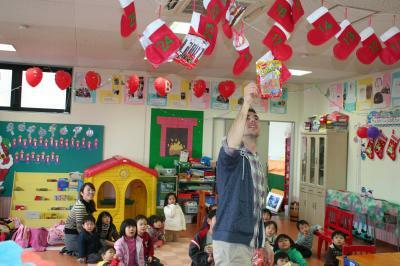 The calendar is made up of 25 felt Christmas stockings representing the 25 days of December until Christmas. Each stocking is filled with snacks that we get at the end of each day. We always look forward to seeing what is inside each day’s stocking! We played a guess what? game. Our teacher gave us some hints about a Christmas item and we tried to guess what it was. 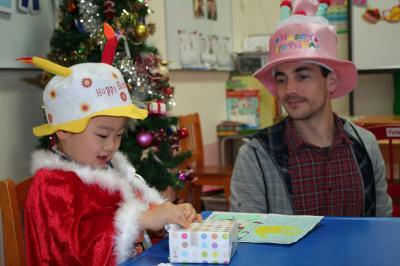 Today we held a birthday party for our December birthday boy. We had a great time listening to his mother’s stories of him, and we even got to make pancakes for a snack.Happy BIrthday! Today we practiced for out annual Christmas play. We used the sleigh we made yesterday. It looks so real! We hope our families enjoy our play, we a working so hard. 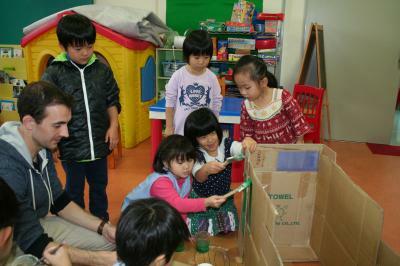 We are making a sleigh for our Christmas play. Today we started painting it in green. Today was Friday and Show and Tell day. The topic for today was “Winter Scenes” and we brought our favorite pictures and objects to show our friends. We even brought a snowman! Today is our favorite Flamenco lesson day. 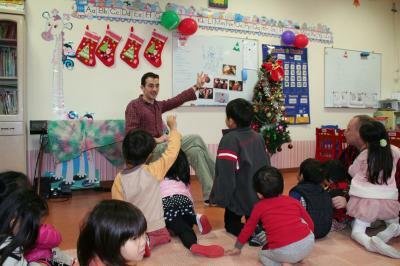 We danced to Flamenco music, and practiced counting from one to ten in Spanish. It was fun! We rehearsed our Christmas play today. We will perform it at the Christmas Party on December 23rd. The story is really cute. 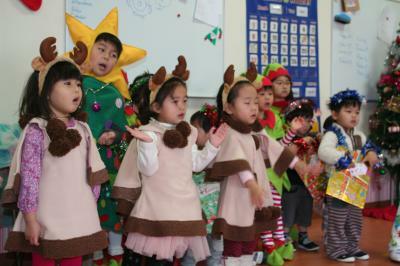 During the play we will sing some Christmas songs, too. December is here. 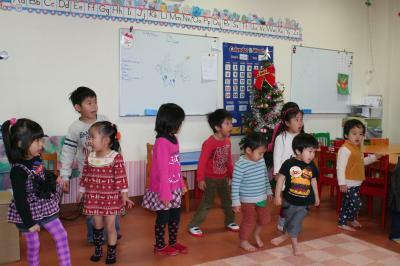 This month’s theme is Christmas and we are practicing many Christmas songs. We like them! We are looking forward to seeing Santa soon!